In March 1943, the Warsaw Ghetto was nearing its end with less than 50,000 Jews remaining in the ghetto. A month later, a small group of young, starving Jewish fighters resisted the German liquidation of the ghetto in the Warsaw Ghetto Uprising, which came to be engraved in Jewish memory after the war. As Holocaust survivors commemorate the 75th anniversary of the uprising next month, it is time to revisit what the situation of the Jewish people was once ghettoization became a reality. 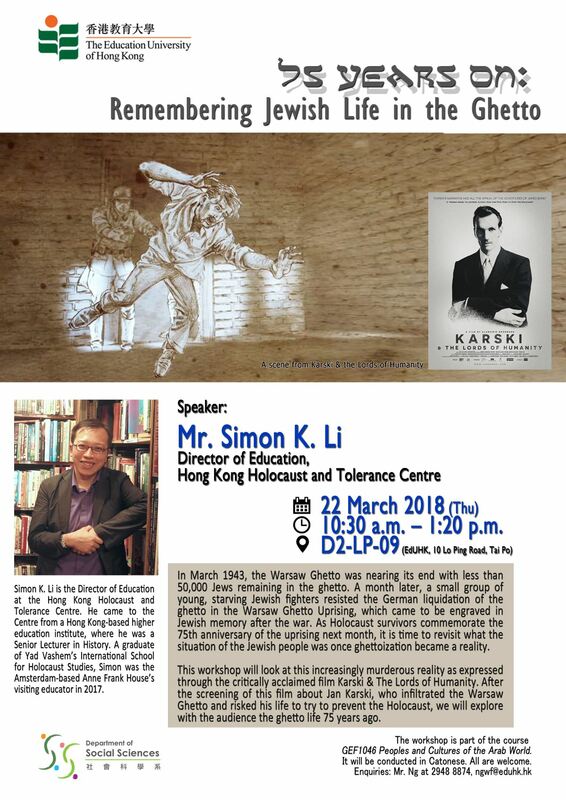 Simon K. Li, the Director of Education of the Hong Kong Holocaust and Tolerance Centre, conducted a well-attended public workshop on the 75th anniversary of the Warsaw Ghetto Uprising at the Education University of Hong Kong on 22 March 2018. It was very encouraging to see many student teachers and current teachers in the audience!